The REAL Housewife of Snohomish County: Sitka and beyond! Today was an interesting day. 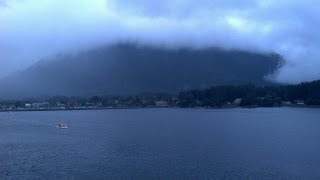 We dropped anchor in the harbor outside of Sitka at around 9 AM. We were supposed to have breakfast delivered between 8 and 8:30 this morning, but we didn’t check the proper box on the sheet so breakfast wasn’t delivered until 15 minutes before we were supposed to leave for our Sea Otter and Wildlife Cruise. And if any of you know me, you know that I’m not a fan of when things don’t go the way they are supposed to. Even if this is vacation and it’s supposed to be laid back, I still hold things to a certain standard. And when those things don’t happen as planned…well I tend to be a bit irritated. We left for our Sea Otter and Wildlife cruise at around 9:30 AM, and the seas were a little bit rough as it was starting to rain again. After the seas last night I didn’t know if I was going to be up for any of this! Last night was tough, the seas didn’t settle down until around 5 AM this morning. What a rough night! But back to our cruise! We went out into Silver Sound and were treated to several sightings of a humpback whale. We were lucky to have it do several short dives and spending a fair bit of time at the surface. 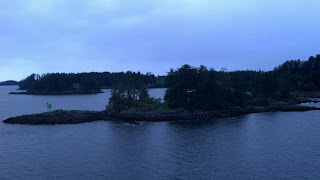 We then continued on further south, and were able to see sea otters, puffins, a ton of bald eagles (including three juvenile ones), harbor seals, and on our way back we even saw a grey whale. All in all, it was a great cruise. However, as we’ve discussed in the past few entries…I am without my camera, so things could have been better. Tonight is our final “formal night” for dining, so I get to put on my suit again. I wonder who we’ll be seated next to at dinner. Anyways, the ship has pulled up anchor and we are leaving the harbor, heading for open ocean. The captain came on a bit ago and apologized for the rough weather, and said that most of our trip to Ketchikan will be through the Inside Passage so it should be a better voyage tonight.